A few months ago I decided to pursue my goal of being published and emailed some of my LO's to a local South African scrapbooking magazine called Scrap Affairs to see if they would be interested in my work. They were kind enough to publish one of my LO's in the very next issue and I thought that would be it. 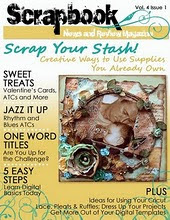 I was then absolutely delighted to find out I had been selected as a Scrapbooking Diva and would get a 2 page spread. The issue has just come out and I just had to show this off...........I'm sooooo excited!!! I was jumping up and down in the store isle when I opened the mag and saw this. This is far more than I was hoping for when I sent that email. Congratulations my friend!!!! I'm so happy for you!